Potty training or housebreaking a puppy is a milestone in its life and one that will help it fit into family life easily, bringing the joy associated with owning a well-trained pet rather than the stress and mess of having to clean up after it all the time. Night-time potty training can seem especially difficult but by following a schedule to help your puppy understand what is expected of him, it can be achieved in a relatively short space of time. Set a regular schedule for potty breaks during the day to give your puppy as much opportunity to learn to potty outside in your chosen location. 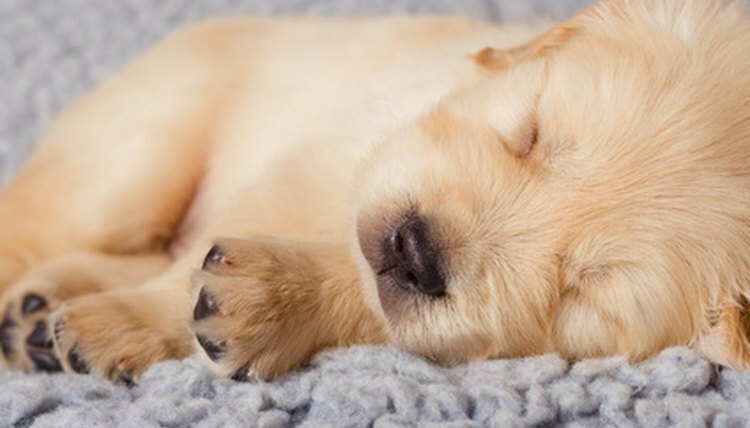 Puppies usually need six to eight of these breaks during the day, leaving an hour between each break. Add feeding times to your schedule to tie in with the potty breaks. Take your puppy for a break after he has eaten as his stomach is small and unable to hold on to waste products for too long. As a rule of thumb puppies eliminate approximately 15 minutes after drinking and approximately 30 minutes after eating. Do an activity with your pet before bed to use up excess energy. Play ball or chase for 30 minutes to tire her out and help her get to sleep quickly. Feed and give your puppy a potty break right before bed time. Say a set command like “go pee” or “do your business” when she is urinating outside and then you can start saying this before she urinates so she knows what you want her to do. Always offer praise when she potties in the right place to let her know that she's done a good job. Put your puppy in his crate or puppy pen in a location away from noise, preferably with a wipe clean floor space to minimise the clean up should an accident happen. This way he gets an undisturbed sleep and is less likely to wake up during the night and make a mess. Puppies less than four months old may need one toilet break during the night, but this can stop as they get older and understand the routine of your house. Greet your pet in the morning with a quick "hello" and take her straight outside to avoid excitement urination. And praise her when she gets it right. Always clean up puppy waste as soon as possible to ensure the smells associated with it don’t linger to encourage your pet to continue using that spot as a bathroom. Only scold your puppy for messing in the house when you see him in the act, otherwise he has no idea what he's done wrong. Puppies under 12 weeks old are unable to control their bladders, so if accidents happen, they can’t help it. Don’t use ammonia-based cleaning products as they smell like urine to a dog.